Jewelweed is an excellent natural remedy for poison ivy, poison oak, bug bites, and general itchy skin conditions. 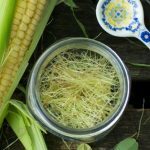 If you’re fortunate to have any growing around you, be sure to harvest some now to preserve for year ’round use! Lately there’s been an increase in reader interest and questions about jewelweed, so I took a quick video clip of how I make “jewelweed juice” to share here on my site. 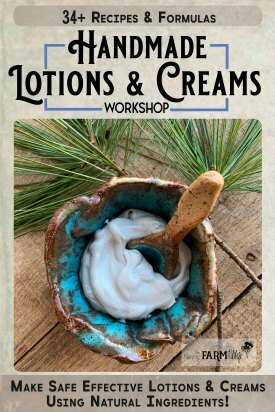 In addition, you’ll also learn how to preserve it in vinegar, plus I have a jewelweed soap recipe and more project ideas shared below. Jewelweed, a pretty annual wildflower, also called spotted touch-me-not, balsam weed, slipper weed, and more, enjoys growing in moist shady spots. I usually find it growing not far from the couple of creeks that cut through our property. It’s fine to use the flowers in your jewelweed concoctions, but the good stuff is mainly found in stems and leaves. The earlier in the season that you pick jewelweed, the more juice it may have available. My favorite way to preserve jewelweed is to puree with some water, strain, and freeze the resulting juice in ice trays. You can either thaw a portion for several hours in the refrigerator, or lightly rub a frozen cube directly over itchy spots as needed. How much water you add to the mix is really up to you and how juicy your plant is. You might need more water later in the season. Add enough to make blending easy and to ensure you have a good supply of juice. This vinegar is helpful to keep on hand for itchy skin flares and it doesn’t require refrigeration. 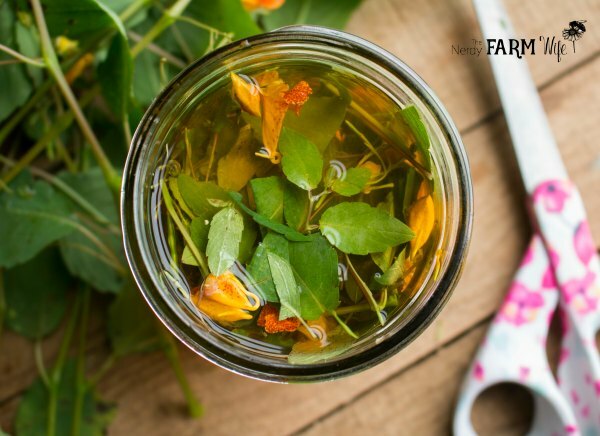 Coarsely chop fresh jewelweed and place in a jar, filling 1/2 to 3/4 of the way, lightly packing as you go. Pour apple cider vinegar over the fresh plant matter until the jar is filled. Stir a few times with a chopstick or knife to release any air bubbles. Cover with a plastic cap, or place a few layers of plastic wrap or parchment paper between a metal lid and the jar. This forms a barrier that prevents the vinegar from corroding the metal top over time. Allow to infuse for 3 to 4 weeks, then strain into a clean jar. Cover with a plastic cap, label, and store until needed. Shelf life is about one year. To use jewelweed vinegar: Saturate a cotton ball with the infused vinegar and gently rub over itchy spots. Allow to air dry on your skin. Apply as needed for relief. Extra sensitive skin types may want to dilute with water before use. 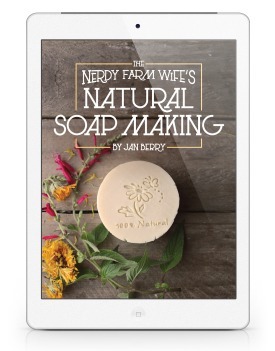 This recipe comes straight from the pages of my Simple & Natural Soapmaking print book. If plantain isn’t available, you could use violet, chickweed, or comfrey leaves instead, or just add extra jewelweed to the mix. Oil, water, and lye amounts are all measured by weight. You must use an accurate scale to make soap. 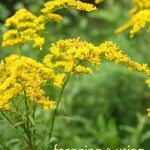 Blend the jewelweed and plantain together with 2 ounces of water until fully pureed. Add the rest of the water and stir well. Place the mixture in the refrigerator to infuse for several hours or overnight. Remove and strain the resulting greenish-brown juice. Weigh out 8.5 oz for use in the soap, adding more distilled water as needed. Wearing gloves & protective eyewear, carefully stir the lye into the chilled jewelweed/plantain juice. Stir in the chlorella powder. The lye solution may develop an unpleasant skunk-like smell; this is normal and won’t last. Set the lye solution in a safe place to cool for about 30 to 40 minutes, or until it reaches around 100 to 110°F. Warm the oils to 100 to 110°F, then blend in the cooled lye solution. Using a combination of hand stirring and an immersion blender, stir the soap until it reaches trace. Stir in the lavender essential oil, if using, then pour into a prepared mold. Cover and allow to remain in the mold for at least 24 hours, or until it can be removed easily. Cut into bars and cure for at least 4 to 6 weeks. 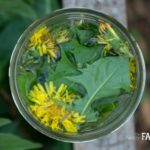 I haven’t tried it yet, but this tutorial on using jewelweed as a natural dye also looks fun to try! It’s most effective when used fresh, so I generally don’t dry jewelweed for oil infusions. However, some herbalists infuse oil with fresh chopped jewelweed stems simmered over low heat. Hearth and Vine has a great jewelweed oil infusion tutorial at their site, plus a really fun note about making a whistle from the stems! And there you have it! 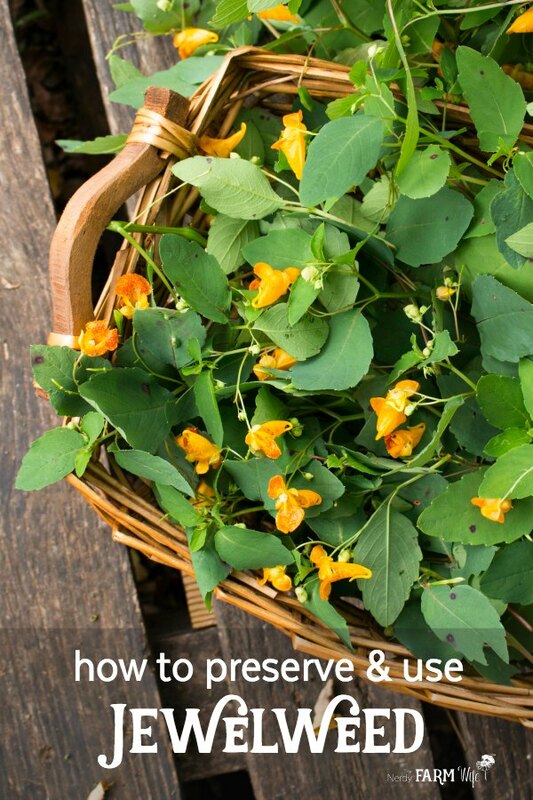 I hope you enjoyed learning these 6 ways to use jewelweed. If so, let’s keep in touch! 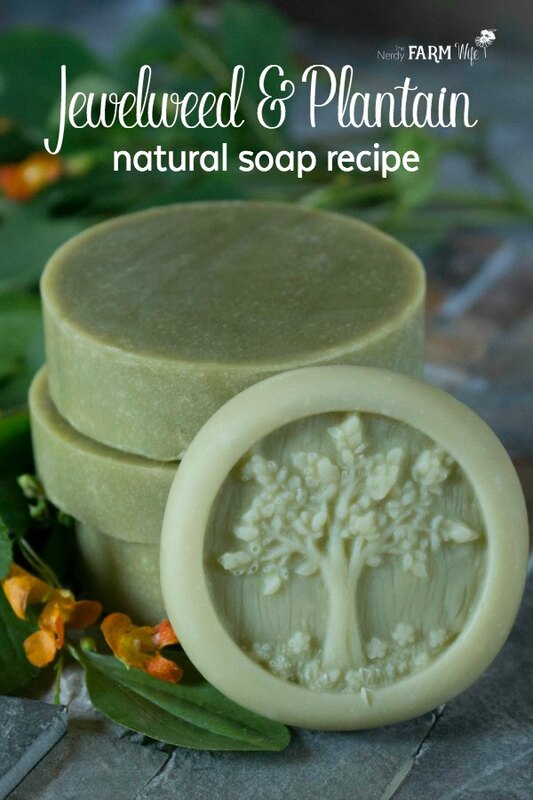 Subscribe to my newsletter to receive 2 to 4 emails per month sharing my latest herbal projects, DIY body care tutorials & natural soapmaking recipes. What a wonderful article, thank you. I’m going to check ouy your book too!